Ted spends a lot of time in the outdoors, skiing, running, or climbing, both recreationally and professionally. He began working as a ski instructor for the Aspen Skiing Company in 1997 and in summers filled days as a mountain bike and hut trip guide. 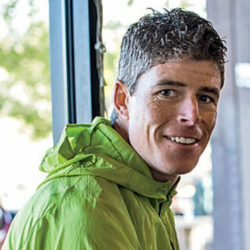 Outside of work he’s climbed mountains around the world including Mount Everest, has more than 50 ultra-distance trail races under his belt, and in 2015 was honored as National Geographic’s Adventurer of the Year for ski mountaineering after successfully climbing and skiing the 100 tallest peaks in Colorado. He’s recently worked as a freelance website designer, digital marketer, and outdoor photographer which keeps him in tune to the trends and developments of the fast-changing digital world. Always one to embrace technology in the outdoors, he’s an avid user of modern day platforms to help with planning, safety, and/or communication– basically anything that can help contribute to safety and success in the outdoors.